Jaguar has published a tribute film to the absolutely unprecedented showing of Jaguar fans, owners, and their museum-quality pieces at this year's Mille Miglia road race in Italy. Stars and cars is one way to describe the Mille Miglia, but more often than not, it's all about the cars and the stars who happen to own them are secondary. This year's was no different and with the launch of the new F-type this year, Jaguar wanted to make it a particularly special showing. On the 1,000 mile tour as a celebration of the World's Most Beautiful Race, hundreds of Jaguar drivers and owners showed up to parade through Italy in one of the most epic driving events in the world. Three stunning examples of the Jaguar XK120, perhaps the most recognized Jag of all time, were driven by stars from Europe and the Americas, including Sir Chris Hoy, Andy Wallace, Daniel Day-Lewis, Jim Gianopulos, David Gandy and Yasmin Le Bon. Those three beautiful rides were joined by Jaguard Heritage Racing examples of the C-Type, driven by Jaguar representatives and famous personalities like Hannah Herzsprung, Alex Buncombe, Chris Harris, Salvatore Ferragamo Jr., and Michael Quinn who is the grandson of Jaguar founder Sir William Lyons. 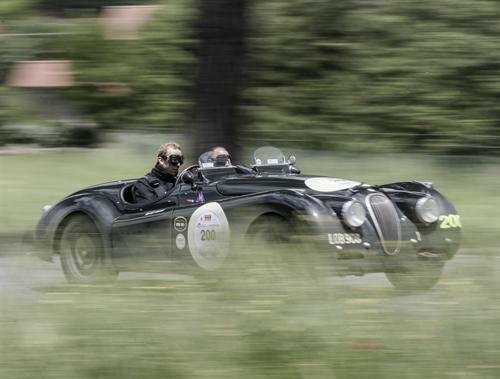 This year's Mille Miglia featured more than 400 classic race and road cars. In fact, if you can name a deserving sports car make or model from the dawn of automotive to the 1950s, it was likely on that road in Italy.